"World's Largest Selection of Prowler Products!" ►Need a Chrysler factory Part? We have Any Factory MOPAR part for LESS than your dealer for your Prowler (or any other Chrysler vehicle). email a detailed description and a part number for a quote or give us a call. 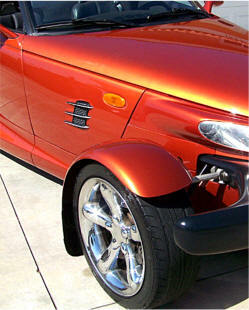 To Order: Prowler Plymouth or Chrysler Prowler accessories may be ordered either with or without a PayPal account. Simply add the Prowler items you desire to your cart, and upon checkout you can either sign-in to pay through your PayPal account, or you may simply pay by credit card without having an account. 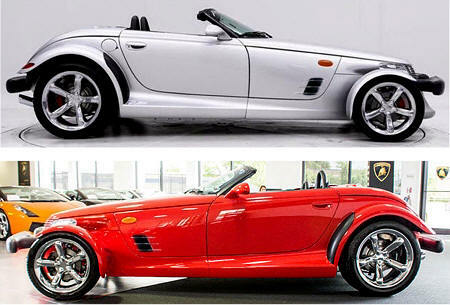 IMPORTANT Shipping Information: TheProwlerStore.com Ships its Chrysler Plymouth Prowler parts and accessories to North America and Europe. For Alaska, Hawaii, U.S. territories, Canada and Europe - You may check out using US Mainland Shipping Rates. Once we receive your order we will then invoice you for the extra shipping. We always try to consolidate overseas orders to save you the most money possible. To know what the shipping would be before you order - Please call or email us for amount of extra postage. ORDER by FAX: List the items you want with prices and Postage and Handling. Provide your address, email, phone number, and credit card number, name on the card and expiration date. Simply fax us (to print a copy of our Fax Order Form Click here) Fax to: 1-352-688-8153 we will process your order and provide you with a confirmation and receipt. The global leader in online payments. PayPal is how individuals and businesses send and receive money online. The Prowler Store uses the PayPal secure payment service and maintains an authorized PayPal account. 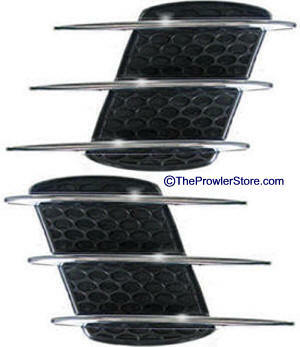 Large Flexible Black Grille pad with three ABS chrome spears. Attaches as a peel and stick. Will not damage your cars paint. Easy installation - simply peel and stick - no cutting or modifications to your car. Can be removed later back to stock fender. Looks great! Approximately 9" wide x 6" Tall. Will not rust or corrode. 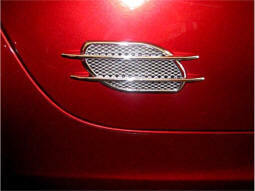 Chrome Grille pad with three ABS chrome spears and chrome mesh with black background. Attaches as a peel and stick. Will not damage your cars paint. Easy installation - no cutting. Can be removed later back to stock fender. Looks great! Approximately 3" x 8.5". This hood scoop measures 14 inches at the mouth, 15.8 inches in length and 2 inches in height it comes in molded black ABS automotive plastic. 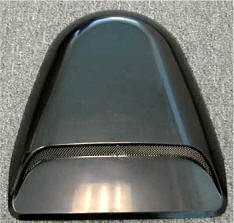 This is a real hood scoop that can duct the air into your hot running high performance engine. 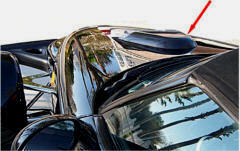 You can mount the scoop on top of your car using the automotive 3M tape attached. This will not permanently damage your car if you choose to remove it later. Mounting the scoop in this manner would be for appearance only. To enable the scoop to act as a cooling duct (this is optional) you will need to cut a hole in your hood. 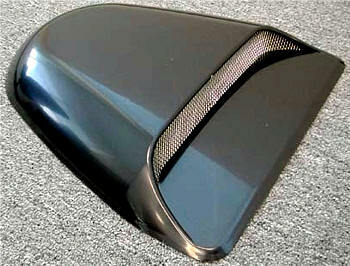 You may use it as a non-functional Hood Scoop to add a high performance look to your Kat as well. No cutting necessary in this case. 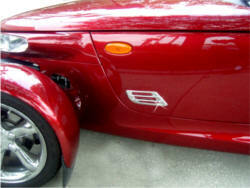 You can also have us paint the scoop to match your Prowler. Simple mounting with double faced automotive body shop tape. No tools required. Mounted at top center of hood above. 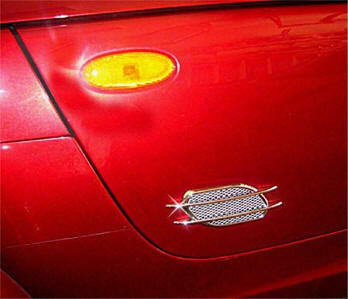 These resin ABS High-Quality Chrome Side panel vents are designed to be decorative not functional. You do not have to cut a hole in your fender. It is a peel and stick accessory. May be removed when you desire. Note: Not sure exactly How to Order? Don't have a PayPal account? Not affiliated with Chrysler Corporation or it's divisions.